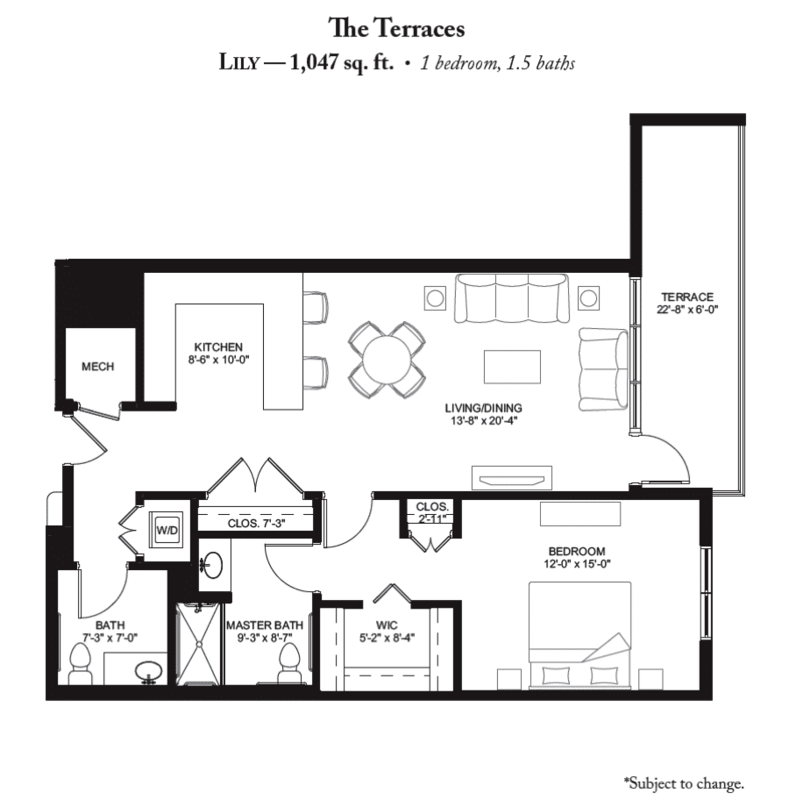 The Lily Apartment Home – Perfect for Entertaining! The Lily apartment home at Fountaingate Gardens is every bit as elegant as its namesake—and an excellent option for someone looking for the perfect place to entertain. A bonus of this particular floor plan is the addition of a half bath. It keeps your master bath private, perfect for people who love to entertain, but also value privacy. As you enter the Lily apartment home, your guest bath and laundry area is nestled out of sight. Take a few more steps inside, and you will find yourself in the open-concept living area, with three oversized windows looking out to the spacious terrace. Inside and outside, you’ll experience the natural light, cool breezes and quiet ambiance of the pond and gardens below. The kitchen, which features high quality, stainless steel appliances and granite countertops, is designed for ease. You’ll be able to reach everything you need, with enough space to accommodate more than one chef du jour. The ample storage in the beautiful all-wood cabinetry with self-closing doors and drawers will satisfy your cooking and entertaining needs. The kitchen also features an extended breakfast bar, the perfect place for additional seating or to grab a quick meal. The kitchen opens to the living and dining areas, keeping you connected to guests when refilling serving trays or beverages. Beyond the kitchen is the living and dining area, which has plenty of room to arrange your table and chairs, and your favorite living room set – couch, love seat, end tables, coffee table and television! The living and dining area also has a spacious closet – perfect for coats, shoes and holiday decorations or other seasonal items. The oversized terrace is accessible from the living room. Spanning more than 22 feet long, the terrace has plenty of room for a small set of patio furniture and plants, and depending on the location you choose, will be bathed in the soft glow of afternoon sun or greet each morning with a sunrise. The master bedroom suite in The Lily features ample space for your bedroom set (we show a king sized bed as an example! ), two windows to let in natural light and ample storage. Two closets – one a walk in and a second that could serve as a linen closet for the master bathroom – are located adjacent. The master bathroom is en suite, creating complete privacy. When you choose The Lily as your new apartment home, you’re choosing the dynamic lifestyle that will be offered by Fountaingate Gardens, a proposed Life Plan Community, also known as a Continuing Care Retirement Community, or CCRC, that will be built in Commack. For more information about what life can be like at Fountaingate Gardens, please call our friendly, no-pressure sales staff at 631-715-2693 to schedule a personal appointment. Fountaingate Gardens’ Residency Agreement Approval: What Does It Mean for Me?